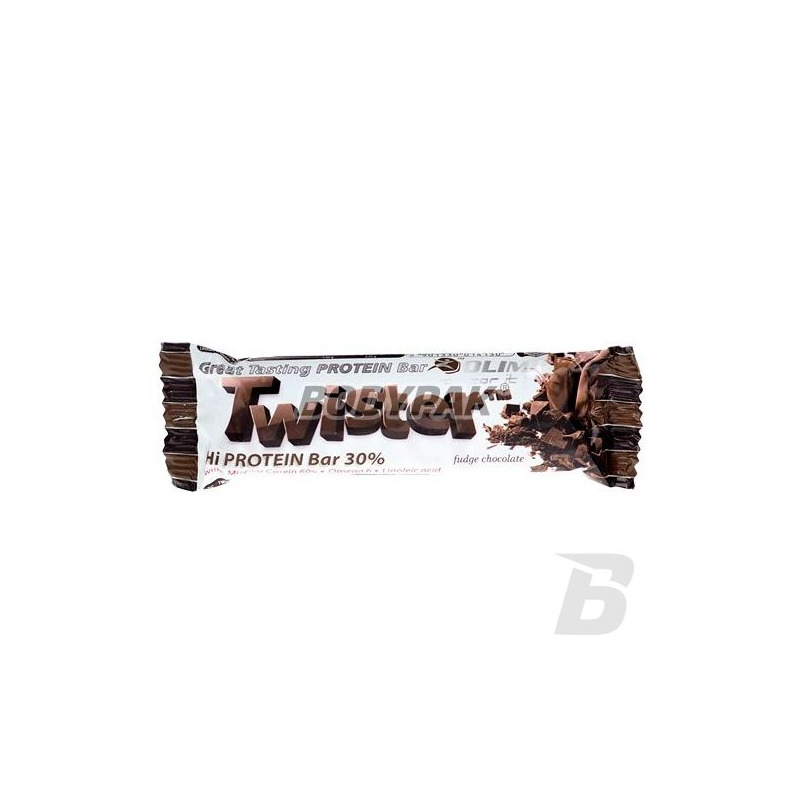 Sensational protein bar, whose composition and taste have been refined in every detail! The high content of wholesome protein derived from WPC will simplify your balanced diet! Baton Twister company Olympus is the perfect solution for you in as a delicious and healthy bar. TWISTER is high in protein, containing all the essential amino acids. These are the building blocks that make up our body, from muscles, skin and internal organs to hair and nails. Daily physical activity causes these structures to break down, making it necessary to supply high protein, easily digestible form, containing all 20 amino acids. In addition, rich in protein (protein) diet accelerates metabolism, and improves the overall condition of your body. The innovative formula of the TWISTER protein blend contains up to 30% of the best proteins, of which 60% is casein. It is a protein that breaks down slowly, ensuring the sustained supply of building blocks for several hours. This is a very valuable source of protein, providing perfect protection against catabolic (breakdown), which are intensified during and after exercise. Casein activity is ideally complemented by whey proteins, constituting up to 30% blendu protein, which absorbed much faster, which is especially important after a workout, when you need to supplement lost as a result of amino acids. The unique protein matrix protein supplemented with soybean best vegetable protein source. They are rich in saponins, phytosterols and isoflavones - highly active substances with beneficial effects on the body. A particularly positive effect they cause in women improve skeletal system mineralization, positively influence the female endocrine and cardiovascular system. Soybean proteins are also perfect for the diet of physically active people and athletes who want to maintain proper muscle mass. The combination of three protein sources, with varied absorption times, composition and amino acid proportions in a single TWISTER Batoni, is particularly beneficial and allows for effective replenishment of essential building blocks at any time and leaves you feeling satisfied. TWISTER is a high source of protein that is excellent after a training session or between meals as a rich, nutritious and tasty snack. TWISTER is a source of healthy and essential energy components. It is rich in essential for active people carbohydrates that will provide a real boost of energy. In one delicious bar we hid quickly absorbed necessary after physical exertion, as well as during the day carbohydrates. TWISTER is the source of the energy you need every day. TWISTER is an integrated product that also contains essential in our daily diet healthy fats. It is also enriched in essential polyunsaturated fatty acids: OMEGA-6 and linoleic acid. Fatty acids Omega-6 support the healthy functioning of the nervous system and cardiovascular. They can also have a positive impact on our ability to logical thinking and memory. Linoleic acid is a special representative of the OMEGA-6 family, a particularly valuable and essential nutrient that our body can not produce by itself. Smak tiramisu rewelka!!! Gdyby zmniejszyc ilosc cukrów prostych i tłuszczów to w skali od 1-6 dalbym 6,ale przez to daję5.Jako zamiennik dla zwyklych batonów jest super!Polecam. Dobry w smaku, ale skład mógłby być troche lepszy..
Przepyszny baton jako przekąska i dobicie kalorii w ciągu dnia! Pistacja najlepsza! Jedyny minusik to dość duża zawartość cukru prostego. Extremely tasty snack of protein concentration at the level of 25%. The ideal snack that will provide the highest quality nutrients. Bet on the quality! High quality baton with increased amounts of protein and sensational creamy taste with crunchy nuts. The ideal variety to your diet! It can serve as a meal replacement.